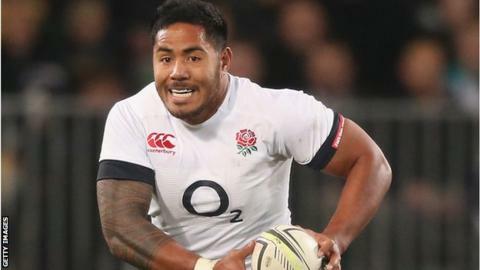 England's Six Nations opener against Wales next month may come too soon for Manu Tuilagi, according to Leicester director of rugby Richard Cockerill. England play Wales in Cardiff on 6 February but Cockerill said: "It may well come too soon, we'll see. "It's a day-by-day, week-by-week thing. Manu is so important to club and country." Speaking after Leicester's 17-8 Premiership victory over Bath on Sunday, Cockerill added: "By the end of this month, Manu will be playing. He is progressing really well, and we want to get him right. "He will be fit for the Six Nations at some point." Tuilagi missed England's autumn internationals after suffering a recurrence of a groin injury in Leicester's European Champions Cup win over Ulster on 18 October. Cockerill has urged England head coach Stuart Lancaster to give 25-times capped Tuilagi time to return to 100% fitness with this autumn's World Cup in mind. "The World Cup is huge and you don't need your best players breaking down," he said. "Stuart needs a fully-fit squad going into the World Cup, you don't want to be risking guys. "We'll be patient and England have some good players as well so they will probably miss him less than we do."